Bryn and I are going to walk part of The Cleveland Way. Bryn is my thirty something fairly fit son. I'm his overweight ageing dad. The main issues have been, or still are: time off work, fitness and equipment. Time off work is settled. Setting out on 5th August 2009 we have eight days; a day to get to our start point, six walking days covering 90 miles and then a day to get back to our respective homes. Fitness - working on it. We have another 20 weeks (approx) to prepare ourselves. My plan started a week ago with a slight change in diet and minor exercise. My aim is to lose weight (a pound a week) and to improve strength and stamina. Bryn's aim is the same but he is not seriously overweight as I am. He attends the gym. I will from next month. Equipment - working on it. 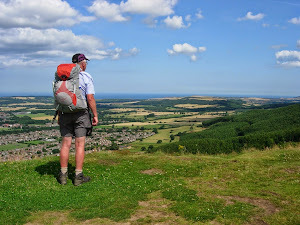 The Cleveland Way was my first long distance walk - about 20 years ago when I was much fitter and leaner. My rucksack then (when including food and water) weighed up to 42lbs. This time I plan to keep the pack weight under 20lbs. There have been massive and exciting changes to trekking equipment since my first walk and Bryn and I have been checking out some of the highly desirable lightweight gear now on offer. My (retired) Berghaus Pulsar 60BC Plus rucksack weighs 4lb 6oz. I've just bought the most beautiful looking Osprey Exos 46. It only weighs 2lb 2oz! Weight Watch: 9-16 March -2lbs. Since 9 March -2lbs. Good luck with the walk - I shall be following your efforts on here with great interest, Brian. Your rucksack should easily cope with it all. I am taking the same one across scotland on the TGO Challenge in May. Thank you Alan. Most kind of you. I'm not in your league with the blogging so I feel most honoured that you'll be watching! Good luck with your TGO.